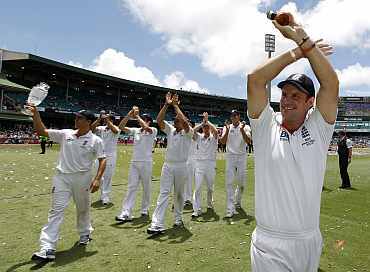 Captain Andrew Strauss saluted his players for an "outstanding" tour after England completed a crushing innings and 83-run victory on Friday to win their first Ashes series on Australian soil in 24 years. Australia's last three batsmen were dismissed shortly before lunch on the fifth day to seal the five-Test series 3-1, and England celebrated wildly in front of thousands of joyous supporters at the Sydney Cricket Ground. "It's been an outstanding tour so far," said an elated Strauss, whose quick-fire 60 on day two set the tone for his team's record innings of 644. "The guys can be very, very proud of what they've achieved, not just the players but the backroom staff as well," he added. After a draw in the opening match in Brisbane, England won the second by an innings and 71 runs in Adelaide, only for the hosts to claim a 267-run victory in Perth. England recovered spectacularly in Melbourne, thrashing Australia by an innings and 157 runs to retain the Ashes, but were quick to wrap up the celebrations ahead of Sydney. Strauss praised pace bowler James Anderson and man-of-the-match and series Alastair Cook, whose 766 runs anchored England's batting throughout the series. 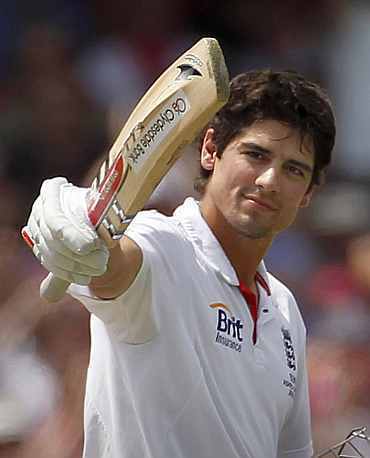 "Alastair has been outstanding. When you're talking about the likes of Wally Hammond and people like that, he's really had an amazing series. "Jimmy Anderson in tough conditions has been outstanding as well ... You can't really pick one or two players out of the team because everyone's delivered at different times and that generally is a recipe for success. "It's what we knew we needed to do at the start of the tour and all credit to the players, they've stood up and delivered," he added. Strauss also paid tribute to batsman Paul Collingwood, who announced his retirement from Test cricket on Thursday. "Massive loss. There's certainly a tinge of sadness there for us ... Colly's been one of the great servants of the game, there's no doubt about it. "He kind of epitomises what this team's all about. He'll be sorely missed," he added. The Sydney Test victory made Strauss the first captain to win a series victory in Australia since Mike Gatting led the tourists to a 2-1 victory in 1986/87. 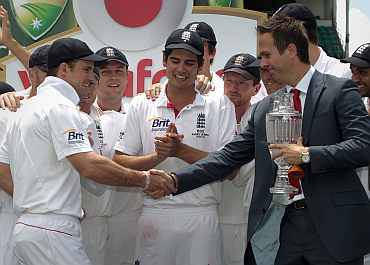 It was all the more special for the 33-year-old, who was a member of the team that arrived with the urn in 2006/07 but handed it straight back in humiliation after a 5-0 whitewash. The Sydney Cricket Ground will hold far more precious memories for the England team, whose "Barmy Army" of supporters sang and chanted in celebration throughout the morning. "We've truly valued all the support we've had over all five Test matches ... A lot of the time it's felt like a home game," said Strauss, who also thanked the players' families as "probably out greatest supporters." "They deserve it every bit as much as we do," he added.